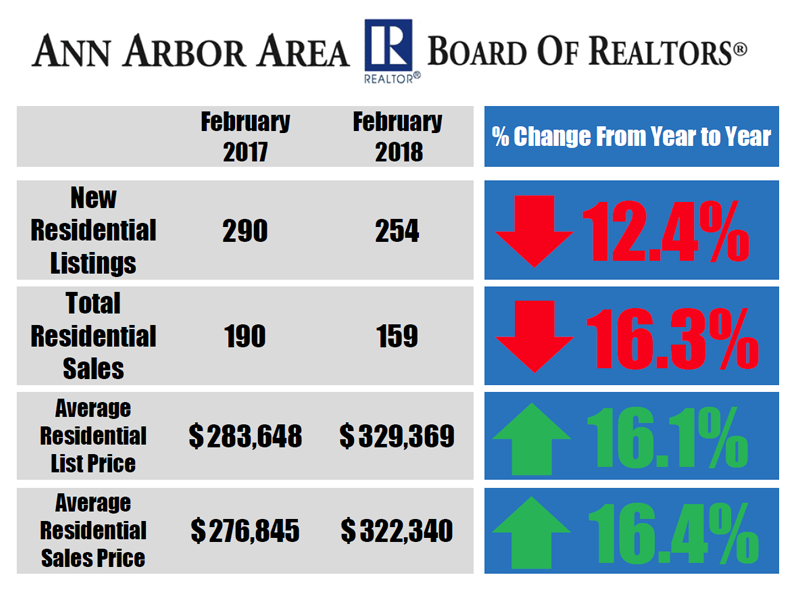 Average listing and sales prices for single family homes continue to keep rising, according to data released by the Ann Arbor Area Board of REALTORS®. The average residential listing price in February 2018 rose a significant 16.1% to $329,369, compared to $283,648 in February 2017. Average residential sales prices also increased considerably 16.4% in February 2018 at $322,340, compared to $276,845 in February 2017. Inventory continues to be scarce, with a total of 254 new residential listings for February 2018, compared to 290 new residential listings in February 2017. Total residential sales have accordingly dropped 16.3% in February 2018, with 159 sales compared to 190 sales in February 2017. Though there are fewer new listings and sales year-to-date in 2018 compared to 2017, the year-to-date sales volume for residential listings in 2018 is up 3.9% from 2017. This is likely due to the fact that 24% of listings year-to-date have sold above list price and 18% have sold at list price, compared to 18% above and 18% at list price in 2017. To see more Ann Arbor Area housing statistics, view the February 2018 Housing Statistics Report.